This ancient and remarkable fortress is the family home of Sir Humphry Wakefield Bt. and The Hon. Lady Wakefield. Since 1246, the castle has been owned by one continuous bloodline relating back to the Earls Grey. Grand state rooms juxtapose alarming dungeons and torture chambers. There are beautiful parklands, lakes, gardens by historic designers, statues and fountains. Today, the castle thrives with day-to-day family life along with music and drama, and even mountain rescue, child welfare and other local interests. Why not stay the night and join a Ghost Tour? We have a broad display of killing weapons with guns, arms, armour and even poison blow-pipes, with a collection of extraordinary and rare insects. The fine collection of mediaeval “Arquebuses” (portable-cannons) were for castle defence from the early 1500s, when big cannons were in their first effective days. In the 1800s, the castle armoury included 27 rifles by the famous maker, Purdey. The unusual Fallow deer heads come from the Estate and today’s sporting equipment packs out the shelves. See the painting of the haunting witch, she curses any who steal from Chillingham – proved by letters from those who thought it a joke! Interesting photographs of Everest show Sir Humphry Wakefield’s Great Uncle Arthur, who reached just 500 yards from the summit. The Great Uncle was just dressed in tweeds, and that was thirty full years before Hillary and Tensing conquered Everest in Coronation Year 1953. Compare Sir Humphry’s own Everest ‘high altitude’ boots with the plain nailed boots of Great Uncle Arthur Wakefield. The great sled of the explorer Norman Vaughan hangs from the ceiling, and see photographs of the great man himself with the Pope’s dog harness too! A giant cooking pot is for feeding the Chillingham garrison and the other massive bowl is for pouring burning oil over unwelcome visitors. The remains of one ancient entrance arch is above the big window by the sled, but changes of entry to the castle vary frequently as new generations had different challenges. The castle dungeon is lit by one small arrow slit in the thick wall and the chamber is marked with the crudely-cut letters, carved by sad prisoners. A trap-door in the floor reveals the very genuine bones of a child in the vault below. Early inmates have scratched their ‘diary’ with incised lines, one for each day. A low passage leans to the side, all fallen in. These passages ran through the thick walls that linked the great towers. They were filled in when they were seen to weaken the walls against cannon fire. Records of those held in this dungeon show it was for hiding, as well as a prison. Note the hugely thick oak door with handles on only one side, the scratched diaries on the walls and the ‘drop’ in the floor leading to deeper chambers. Below the stone flags, five feet down, is another cobbled floor from earlier days. That space is most excellent for drainage. You can see where each tower has different stone from the walls between. The towers were built in the 12/1300s and the walls between in the late 1500s, to make rooms fit to receive the King of Scotland, on his way to the English crown. The Grey lord of those days was Queen Elizabeth’s godchild and also the godchild of her great Chancellor, William Cecil, whose descendants became the Marquess of Salisbury and of Exeter (including Lady Wakefield’s great grandfather!). That Grey was ‘go-between’ for the English and Scottish courts. Eighteen of the Castle Lords were Knights of the Garter and many were courtiers and commanding generals, yet eight of the Castle Lords were executed for treason. St Peter’s Church, in the castle grounds, holds one of the finest examples of a 15th century tomb honouring the famous soldier general, Sir Ralph Grey, and his wife, Elizabeth. 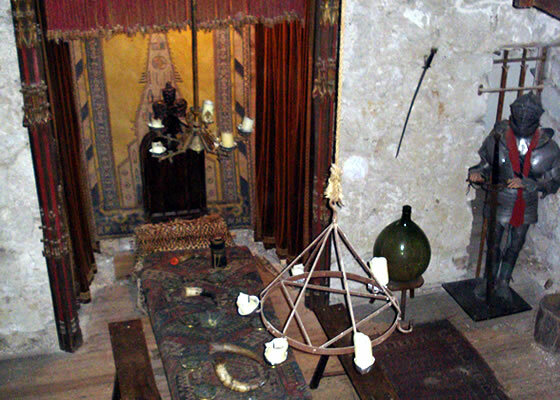 An Elizabethan chamber, it has a typical stone flagged floor, tapestries, armour, weapons and the antlers of deer and wild cattle, just as in former times, and so has a rare and surviving quality of those courtly days. The Great Hall was built between the south towers and over the ancient ‘Undercroft’, especially for the royal visit of James VI of Scotland. Many royals have been entertained here since then. The walls are hung with weapons and trophies from around the world showing both the fierce nature of mankind and the origins of this castle. You can see the remains of the original giant chimney in the south wall, in the right hand end, and the two small high, protective, windows. The room’s first huge windows looked over the courtyard, as you can see from the bricks. There were no big windows on the dangerous outside walls. 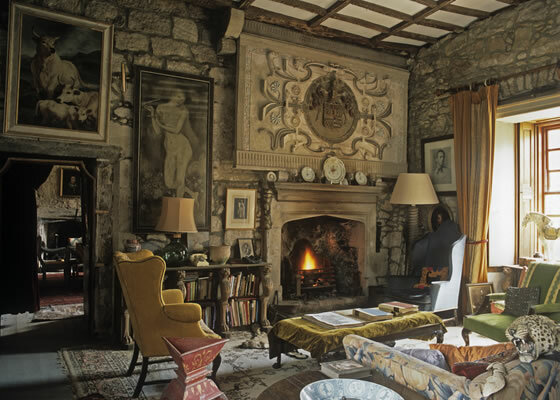 On the way up the stairs you will see into the Artists Room, the entrance of the Pink Room, various ancient weaponry and a 300,000 year old skull of a Wild Bull, from the same family as the Wild Cattle in the Chillingham Castle Park. You will also see the carved stone head of a Saxon Wild Bull from the park, muzzled for sacrifice to their pagan gods. From the roof you see the urns and garden layout of royal gardener, Sir Jeffry Wyatville. There is a fine view of the distant Cheviots. 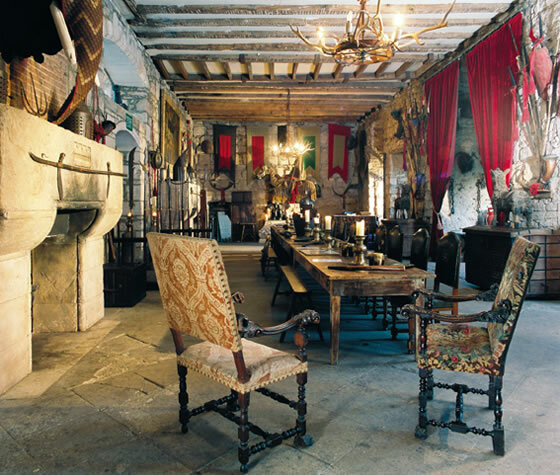 The Edward I Room is the most ancient state room in the castle. Here, the Lords of the castle were secluded up high and safe – well above the stench from the moats below. The room is named after the visit of “Proud Edward, Hammer of the Scots” in 1298, on his way to the battle of Falkirk where he captured William Wallace (Brave Heart), who had ‘visited’ the previous year, burning women and children in a local church. King Henry III will also have stayed here in 1245 when he came by for his Scottish forays. The gothic window overlooking the garden may even have been designed by William of Durham who designed the Coronation Throne in Westminster Abbey, which covered the famous Stone of Scone. The Edward I Room has been restored to its 13th century format with a gallery, armour, weapons and furnishings of its time. Also on display is the castle’s “Licence to Crenellate”, or royal permission to build battlements, issued in 1344. This license was not freely granted, as it meant the castle would be hard for royal troops to assault. The licence was drawn up by Sir Humphry Wakefield’s forebear, William de Wakefield, secretary to King Edward III. Throughout the whole country, this is the only ‘Licence to Crenellate’ actually in its castle of origin. In a secret compartment, to the right of the north window, 125 Elizabethan documents were discovered during renovation – some relating to the Spanish Armada, others to the royal succession of James VI of Scotland. The fine gothic window was installed for the royal visit in 1298. Named after the King’s royal visit to Chillingham in 1603, it is one of a suite of three rooms (James I, Plaque Room Library and the New Dining Room), built especially for the future king. It is famous for its Elizabethan ceiling with the gilded ribbing and very finely moulded pendants. 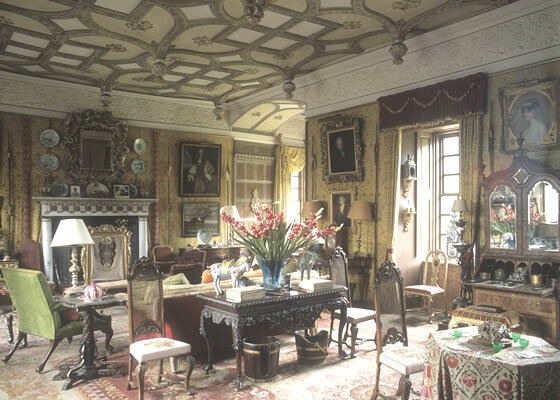 This room is brilliantly furnished with Sir Humphry Wakefield’s extraordinary copies of antique originals and lined with patterned silk, originally made for Chatsworth House. The paintings and tapestries are not important but relate to the Wakefield family and so, of interest to the room. The Plaque Room Library displays intriguing family memorabilia and furnishings. The fine carved stone chimney piece is surmounted by an intricate 16th century plasterwork armorial plaque from the Grey family. There are many paintings of the Chillingham Wild Cattle and many photographs of visitors to the castle, many of which you will recognise. This room was once far more elaborate than the King James room, with a fine four-poster bed for the King to receive his close friends and family. A number of the books relate to the Wakefield family and their exploits, including the founding of Australia and New Zealand as a part of our Empire. The cow, high on the far wall, was a long-time friend to the Castle and a cousin of the Chillingham Wild Cattle. The left-hand portrait is The Marquess of Bath, Lady Wakefield’s great-grandfather. The right-hand portrait is of the current owner’s cousin, Lord Wakefield, Lord Mayor of London (1915 – 1916). In King James I and King Charles I time, this would have been a room for the king to actually sleep and wash in. The royal latrine was in the original tower stairs and the person trusted to look after His Majesty was entitled ‘Groom of the Stool’. The massive guns on the walls are a wonder in themselves and the pictures are of old Spanish Conquistador saints. The white lions are actual casts of a pair, formerly in the Metropolitan Museum in New York, and later sold for four million pounds in Christies Salesrooms. Here is a mass of this and that – royal liveries, craftsmen’s tools, and great clockworks from the Wakefield home in the Lakes, now fitted with electric drives. There are some photographs and paraphernalia of Everest, of Sir Malcolm Campbell’s Blue Bird racing car and the trophies the Wakefield family sponsored. There is a photograph of Sir Humphry’s great uncle in the hydro plane he built when he pioneered flight from water, and a suspended model of the actual plane, with its propeller pushing rather than pulling! There is also memorabilia from when Sir Edward Wakefield was Comptroller of the Royal Household. Wakefield family services take place here and it is restored to the chapel it once was. At one time, it was a library, and the ghost writer, Lady Tankerville, found it hard to accept that she could not find spirits here as two “grinning skeletons” had been found below the floor boards (the bones of which are now in the ‘Ossuary’). She was not to know that they were happily at rest in their chapel! There is much to see here, including the corner tower with its intriguing defensive remains. Medieval in form with the balustraded gallery above for singers, the hall is decorated typically with spears, banners and tapestries. One flag is from King George V’s royal yacht, the other banner comes from the battle of Omdurman, the last cavalry charge ever, and with Winston Churchill along too. The inscription reads “Allah Akbar” or “God is Great”. Amongst the heads on the wall are the world record antlers for a giant prehistoric elk, which may be half a million years old! High up with the antlers, is the world smallest deer amongst the heads of large red deer, which mark out the massive size of the giant elk. There are two huge fireplaces – one with original fire irons, and a carved over-mantel above the other. The great log fires make a romantic setting for a banquet or any gathering. This is full of prehistoric stones and you can work out how the various local tribes traded flint for clay, and how they lived out their lives. They had superbly made axes, and poorly made ones, just as it might be today with varying craftsmanship. There are tools made with antler horn, and fine arrow heads. Often, the tools are curiously similar to those in far off parts of the world. Check out the curious lost room – the stone coffin, or ‘Cyst’, is the finest in the country (if it is, as it appears). All these Bronze Age stones were found by Fritz Berthele, a German tank commander, who was a P.O.W and stayed on after the war to become the local forester. All castles may have had such rooms. If you lost a family friend to the enemy, it would be natural to capture one of them to exchange or encourage talk. Sadly, in many other countries, such repression is alive in the world today. A visit to the Torture Chamber is not for the faint hearted. It displays interesting and gruesome implements of punishment (we hope no longer used in this country), including a stretching rack, cages, a bed of nails, nailed barrel and spiked chair. 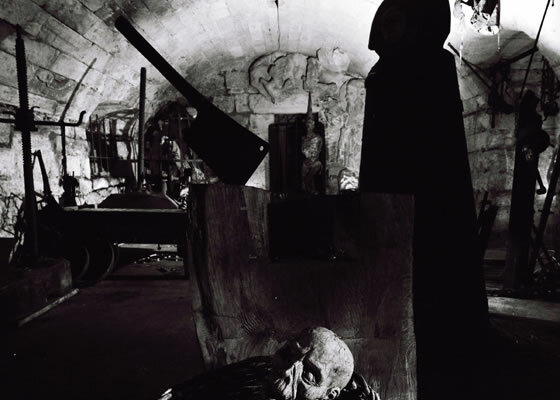 There are executioner’s blocks and the serene face of the Iron Maiden is supported by a horrible, larger-than-life size, hinged and spiked casing, to hold a live body. The thumb screws, chains, leg irons, cages, man traps and branding irons remind of a world long past.